Mike's Good and Evil Hot Sauce - 5 fl oz. Click the button below to add the Mike's Good and Evil Hot Sauce - 5 fl oz. to your wish list. Mikes Good and Evil Hot Sauce - 5 fl oz. This hot and sweet sauce has a kick to it for sure. Serve with your favorite meats, like chicken or pork. Ingredients: Water, orange juice, cane sugar, jalapeno pepper puree, red bell peppers, ginger, garlic powder, citric acid, xanthan gum, monosodium glutamate, pepper, habanera powder, cayenne powder, less than 1/10 of 1% potassium sorbate added as a preservative, erythorbic acid and polysorbate. 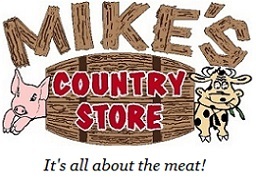 Mike's Robust Ribeye Steak Sauce - 9.5 oz. Mike's Vidalia Peach Hot Sauce - 5 fl oz.